It might not be a novel product when you hear about a battery pack, but what makes portable battery outlet products in demand is the need to provide power to different electronic devices that people use these days. With the number of electronic devices that people are dependent on these days, there is a constant need to charge a device. When you are on the go that is when dilemma hits with the need to power your phone charger, tablet or laptop. Many vendors offer portable chargers on the market. But many of them fail as most are unable to provide adequate power to run a laptop or they run out of charge easily. With the portable chargers becoming another one on the list of items to be charged every now and then, many of these products are launched but they fizzle out soon enough. It is not that the right models of portable chargers are not there yet. Many, such as the Portable Power Outlet has been around for some time and received good reviews from the market. With a capacity of 27000 mAh, such a charger has definitely helped many customers to power their laptops and other devices for quite some time without the need to find an electrical outlet. However, this product and other successful chargers out there have been able to provide power to appliances and devices that need about 90 watt power or less. How about bigger appliances? This has definitely been a demand that has been around for some time. Provide 48000 mAh capacity and powered by Tesla motor battery cells. Provide up to 250 watts of power. International compatibility for power outlets. Named short and simple as the Plug, it is a device that guarantees to end all your quests for powering devices on the go. What’s more, with solar rechargeable features, this also puts this product on top of all others in being eco friendly and everlasting. All your dilemmas of having inadequate power for appliances and batteries running out of power fast would disappear like the wind with this device in your hands. 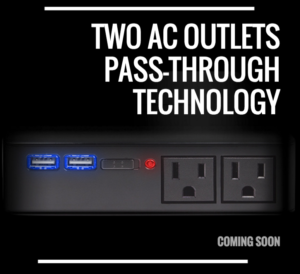 If you are keen to know more about this nifty device that is yet to be launched, you might be lucky to be one of the first ones to know about it here: https://chargetech.com/plug/?kid=A3WG4. Here you can subscribe for more information and get the privilege of a newly launched product. With its predecessor product the Portable Power Outlet having already been a success, you can be sure that this product will only be a step up from its previous generation. Get ready for the launch and visit the link to know more today.